NOW SERVING BREAKFAST & LUNCH IN WESTLAKE VILLAGE! NOW SERVING BREAKFAST, BRUNCH & LUNCH!!! We now have GLUTEN FREE COOKIES, TREATS & CAKES and PIES! LOCAL DELIVERY & NATIONWIDE SHIPPING! OR LOCALLY ON POSTMATES, DOORDASH & uberEATS! Watch on the CBSLA news! In Los Angeles, find a selection of Cake Monkey treats at The Oaks Gourmet, Paper or Plastik, Caffe Vitta, all Umami Burger locations, all Greenleaf Gourmet Chop Shop locations, all PizzaRev locations, Olive & Thyme, Romancing The Bean, Gelato Bar Studio City, Tiago Coffee Bar, all Andante locations, Barclay's Coffee, The Boy & The Bear, Black Bicycle Cafe, Black Elephant Coffee, Cafe If, Coffee by Kofi, Constellation Coffee, Doc.U.Ment, Emma's Coffee, Espresso Cielo, Coffee Gallery (Altadena), Coffee+Food, Jones Coffee, Kafn, Madison + Park, Moby's Coffee & Tea, Steeple House Coffee, LO/CAL, The Next Chapter by Jones Coffee, Red Window Coffee, Spoke Bicycle Cafe, UCB Inner Sanctum Cafe, Everson Royce, Highland Park Wine and Silver Lake Wine. In Orange County, you can find us at Greenleaf Gourmet Chop Shop, Green Door in Carson, Lola's Cafe in Ladera Ranch, Kit Coffee in Costa Mesa, Patch Coffee in Lake Forest, Umami Burger at The Camp and in Huntington Beach at Sweet Elle Cafe. In San Diego, you can find us at Ironsmith Coffee, Copa Vida, Cafe Moto, Hawthorn Coffee and Nordstrom Fashion Valley & La Jolla. 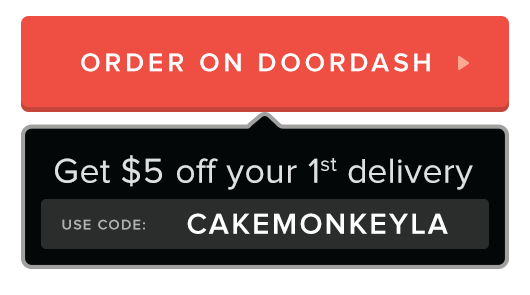 Send a Cake Monkey eGift Card via ItsOnMe! "Thank you for the most delicious cakes I have ever tasted! They make every event special, and worth remembering. Cake Monkey is the absolute best!" Call to order. 48 hour advance notice.